80 • March 2018 • S I G N & D I G I T A L G R A P H I C S ARCHITECTURAL AND ENVIRONMENTAL A wnings that aren't just for shade and shelter can serve as a large canvas for a business's branding—but printing on them takes a few extra steps. With sun and the weather requiring fabrics with greater durability, printers need to use the right inks and technolo- gies to make them last. 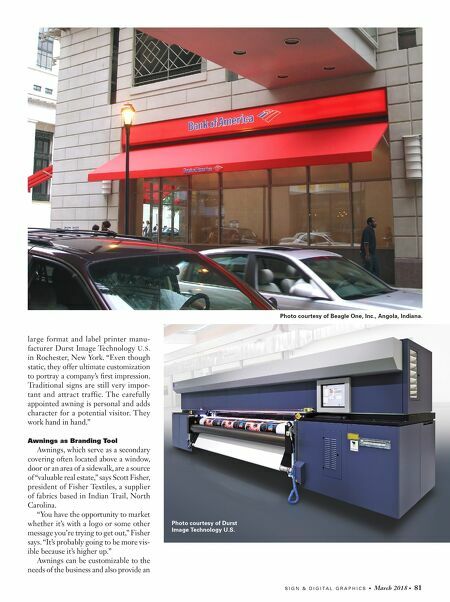 They also need to keep the colors and images vibrant enough to get passersby's attention on what becomes the business's sign or bill- board—it's a platform for the business name to be on the front and sides of the building that adds to that visibility. 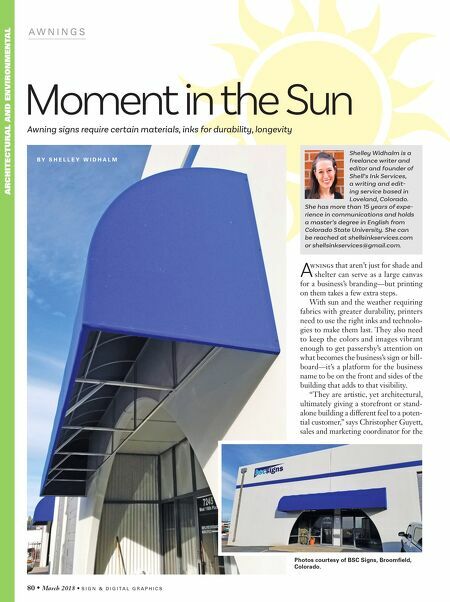 "They are artistic, yet architectural, ultimately giving a storefront or stand- alone building a different feel to a poten- tial customer," says Christopher Guyett, sales and marketing coordinator for the A W N I N G S Moment in the Sun Awning signs require certain materials, inks for durability, longevity Shelley Widhalm is a freelance writer and editor and founder of Shell's Ink Services, a writing and edit- ing service based in Loveland, Colorado. She has more than 15 years of expe- rience in communications and holds a master's degree in English from Colorado State University. She can be reached at shellsinkservices.com or shellsinkservices@gmail.com. B Y S H E L L E Y W I D H A L M Photos courtesy of BSC Signs, Broomfield, Colorado.